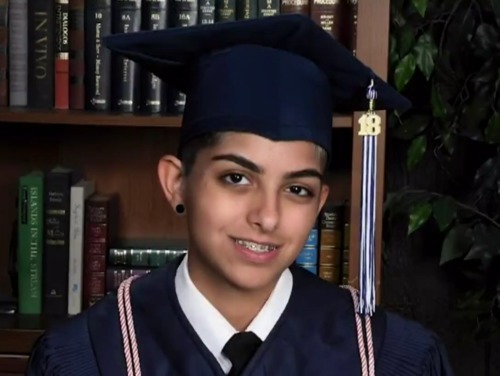 This trans teen had to fight to use his real name at graduation. He won. A transgender teen has been told that his real name will be announced at his graduation ceremony, not his dead name. Jay Alfie at Allen High School near Dallas, Texas, found out a few months ago that the school administration was planning on using his former first name, even though he has gone by “Jay” since he started transitioning in ninth grade. Now the school approved his request to be called by his name. The administration said that the problem was that “Jay” wasn’t his legal name, and they have a policy against nicknames. His family said that they have filed the paperwork to change his name, but that it will take a while because he was born in Mexico and moved to the U.S. with his family when he was 6-years-old. Superintendant Scott Niven said in a statement that filing the paperwork is enough to satisfy the school’s “no nicknames” policy. Jay said that the problem was only solved because of the media attention he received and the MoveOn.org petition that his sister Isabella started. “Without all the people that came together and helped me, I don’t think this would have been possible,” he told The Huffington Post. “They didn’t see it as a big deal, but to me, obviously, it was the biggest deal ever,” he said. The thing is, the school clearly saw this as a big deal. Their “no nicknames” policy makes sense for the most part – they don’t want to call silly nicknames like “Moose” or “Buddy” at what is supposed to be a formal ceremony. And using full legal names even when a nickname isn’t silly – like “Rebecca” instead of “Becky” – is a way of symbolically acknowledging the importance of the ceremony. Jay’s situation is obviously different, and he has been going by that name for years. Requiring a legal name change – which could refer to any of a number of documents, and requires parental support that a student who is either a minor or has just turned 18 might not have – is a big burden. The school’s understandable goal of formality is not more important than the harm that dead-naming a transgender person causes. “I just feel like they should’ve taken into consideration my feelings more than anything before it got so big,” Jay said.